Chicken Rice is comfort food for some and a simple meal to make. It goes well with the garlic-chilli sauce. This recipe was first published in Flavours magazine. Rub chicken with salt. Place oil in a large stockpot and heat, then place the whole chicken in, breast side down. Cook till golden brown, then turn over. Once chicken is fully cooked, remove and allow to cool, then chop into pieces. Heat oil in a wok and add chicken fat. 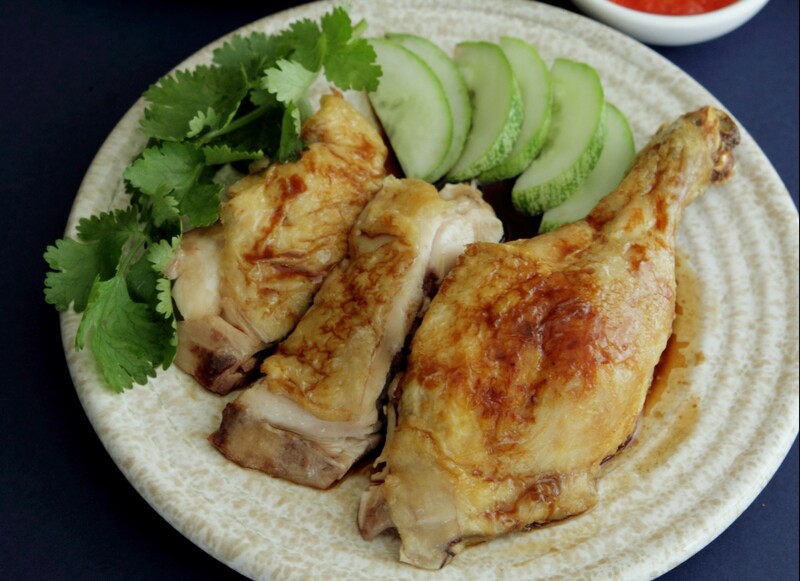 Once the chicken fat becomes light brown, add the margarine, ginger, garlic and pandan leaves. Saute until garlic is golden, then add rice and stir well. Place the mixture in a rice cooker, then add the chicken broth and salt. Cook rice, then fluff with a fork and keep warm. Blend all ingredients till fine, and season to taste. Arrange chicken pieces on top of cucumber, then pour sauce over. Garnish with coriander and serve with rice and chilli sauce.